And I find myself in the ‘wrong’ place at the top of the year. In truth, I wrestled with the idea of going home to Edinburgh for the celebrations but didn’t feel quite up to things emotionally after a difficult time this year and so chose a quiet, sometimes solitary time in Nottingham. I knew I’d have some regrets about this but didn’t know what else to do really. I hope for better times, times when I can truly enjoy myself with my many faithful pals in Edinburgh, in better condition to give a bit back to the people in particular who I’ve become very close to over the years. I’ll miss my buddy and his partner’s house, the chat, the banter and laughs, I’ll very much miss my ‘little sis’, the People’s Republic of Leith, roaming down the shore. I can only think about past times at Easter Road for the moment and my dear home place of Musselburgh. Portobello’s esplanade and a run into the sea breeze along there lies in my imagination at the moment. A brisk stroll down Princes Street and a meander up the old town will have to wait. There’s an Edinburgh derby game going on with my beloved Hibs taking on ‘them’ from across the city. Friends will be there and win, lose or draw it will all result in a blurry, long post-match amongst a gang of old mates and new. We are all one. Not for me this year the Edinburgh Street Party celebrations nor a stool at the bar of the beautiful Cafe Royal or negotiating the revolving doors of the Guildford Arms and warm welcome of many other hostelries I’ve inhabited for so many years. There will be no house parties. It’s what I appeared to choose. All I could do. People are not here now, things have changed and in their place just memories remain. There’s no sorrow though in knowing that I will be back, hopefully in better fettle, not feeling weighed down by a ton of emotion laced with grief. Ready to move forwards again. I know those friends and that beautiful city will still be there. As I write it’s too early for New Year’s wishes but my thoughts are with you all. Here’s to a better 2015 and a hope that surviving will turn into flourishing and steady growth. YESTERDAY, I CAME HOME from my work at the usual time, a little weary, ‘another day, another dollar’ as they say, with its usual trials and tribulations. Collect the mail, what’s for tea – the usual mundane routines that many of us enact. On this day however, there was a large envelope with something substantial enclosed on my doormat. Now, I don’t get all that much mail and for that I’m often grateful!! It’s all brown envelopes isn’t it, never that much fun these days, pay this, respond to that, most of it goes straight to the bin without collecting two hundred pounds. I think we all know the script. But this was different. Ripping open the package, to my enormous surprise I find a pristine hardback copy of ‘Gordon Smith: Prince of Wingers’ the biography of the great and legendary Hibernian and Scotland right-winger and member of the Easter Road club’s Famous Five forward line. I instantly remembered that a little while ago a friend and one who I should add that I have yet to meet in person had promised to send me the story of Gordon Smith, written by his son, Tony Smith. Turning the front cover back I see a note and a host of autographs signed by Hibernian legends. Wonderful. I find this so humbling. That someone a few hundred miles away in my home city had woken up one morning and taken the time to think of me, taken that book in hand, packaged it and sent it to my home in Nottingham. It is a very typical gesture of the kind that I have been the recipient of during the last few difficult and trying months of ‘starting again’. During those months too I have suffered in trying to concentrate for significant periods, something which has upset me and affected my ability to gain enjoyment from a great love of mine, reading but gradually that is slowly coming back, thankfully. So a gesture like this is a significant and important one for me. It is a motivation and part of the process of becoming well again. I have had support close at hand for which I am very grateful, crucial support at times and yet this link, this huge warmth coming from Scotland has been immeasurable and enduring. It it an extraordinary comfort blanket that I have been able to resort to in times of great need. The constant messages, the hospitality, the gifts, the acknowledgments, the warm words thoughts and deeds, the love and friendship – truly extraordinary and yet should I, knowing what I know, expect any other? Perhaps not. 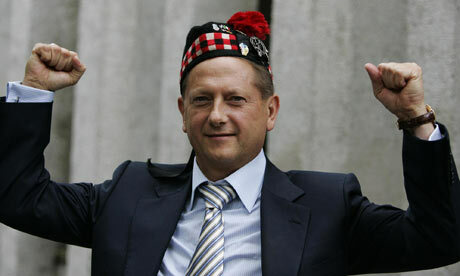 When I was a young laddie I like to think that I was raised with many good Scots values. I was brought up to understand that to give to others is better than to receive. Without being a saint, I have always remembered these words and had a shot at living that way wherever possible. It seemed the right way to me. I now find myself the recipient. I won’t embarrass the kind and thoughtful friend who has extended me this kindness but just to say, if you’re reading ‘K’ thank you for the gesture. Always here for you. I can say from the heart that in no way was I disappointed – despite huge expectations. I’m certainly not a great fan of musicals generally but Sunshine on Leith worked very well for me with the songs being melded into the dialogue opportunely and fairly seamlessly. Of course, being an admirer of The Proclaimers’ body of work helps but nevertheless I felt this aspect of it, from my layman’s point of view, was excellent. A script that possessed genuine emotion and elicited a certain caring for the characters moved things along nicely between Morningside and the old port. The Proclaimers/Hibs connection was skilfully performed with no overkill and just in the right amounts. There is nowhere like home and this eagerly awaited cinematographic ‘ribbon of dreams’ made me want to walk to my car and drive straight to Edinburgh without stopping. I can offer no higher compliment. Driving into Edinburgh, the long road behind me. Bill comes on the radio – seems kind of fitting. AT THE TOP OF THE YEAR it was reported that the Waverley Steps in Edinburgh had undergone a transformation with a new covered walkway and escalator. The 145 year-old thoroughfare’s new look is said to have cost a cool £7m. My own first thoughts on seeing newly released images of it were that the construction looks quite incongruous with the surrounding architecture of the adjacent classic Balmoral Hotel, particularly in the way the roof is situated half way down the hotel’s windows. I really can’t see what else the designers could have done too differently though, apart from shelve the project completely. I’m satisfied that they’ve probably done all they reasonably could with the new structure. Although the design perhaps seems a little ‘chancy’ when considering the historic environment, there are some good points regarding this improvement of the old access to Princes Street. It always seemed to be blowing a huge gale down those steps and it could be a slightly inhospitable first experience of Edinburgh to the visitor. The fact that disabled access to Waverley Station is improved is also a very welcome addition. I guess I was just interested in this story as that familiar trudge up the steps was always a bit symbolic to me. I never minded it because I knew I was visiting back home again and I was always anxious and pleased to see the old place again sometimes after a long wait and that few expectant hours on the train. 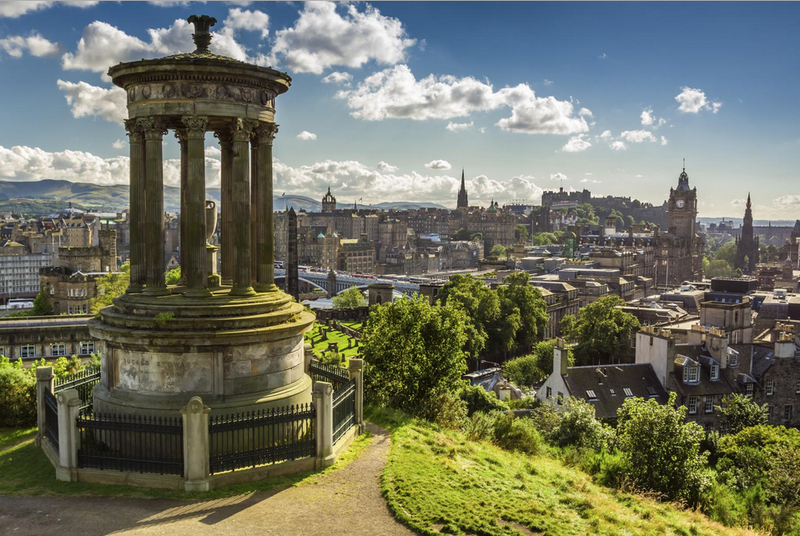 Edinburgh really does show it’s best face to the visitor almost immediately after alighting the old stairway – much more than most cities where the railway stations are often situated in less attractive areas. I tend to drive to Edinburgh these days but the thought of a quick pint or two, with my travel bag chucked in the corner of the Guildford Arms or Cafe Royal after climbing those steps would always set me up for a nice stay. That familiar brewing smell in the Edinburgh air, the old sights followed by a pint in one of my favourite pubs always felt good and welcoming. ‘The holidays starts here’. 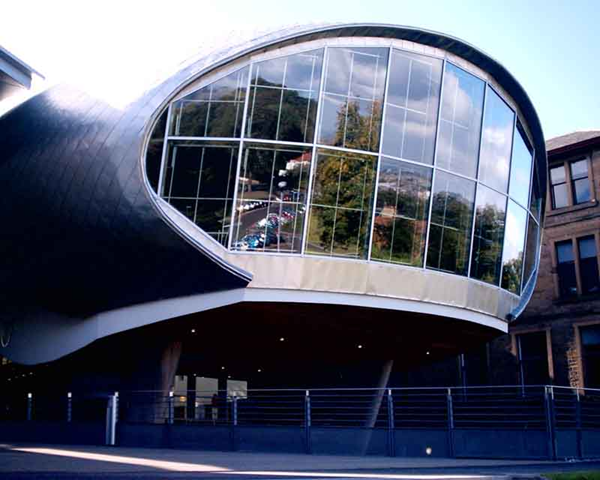 It’s heartening to read that most people appear to be pleased with the the Edinburgh institution’s new incarnation. On a delightfully warm June day a few months ago, I had the good fortune to do something that had been on my mind for some time now, whilst back on one of my many sojourns to Edinburgh. How many wonderful days and night’s have I spent in Hibernian FC’s new and old stadium watching those bright emerald green jerseys with the white sleeves, yet never ventured much beyond the stands for that couple of hours spent supporting my team from boyhood? In truth, that’s not strictly accurate. Way back in 1978, whilst visiting with a friend, I wandered into the very different ‘ER’ of the day and was kindly taken on an impromptu tour by the then groundsman. My memories of that include an explanation of how the recent ban on alcohol in Scottish football had cleared the Easter Road match day aftermath of two skips full of empty bottles and cans. 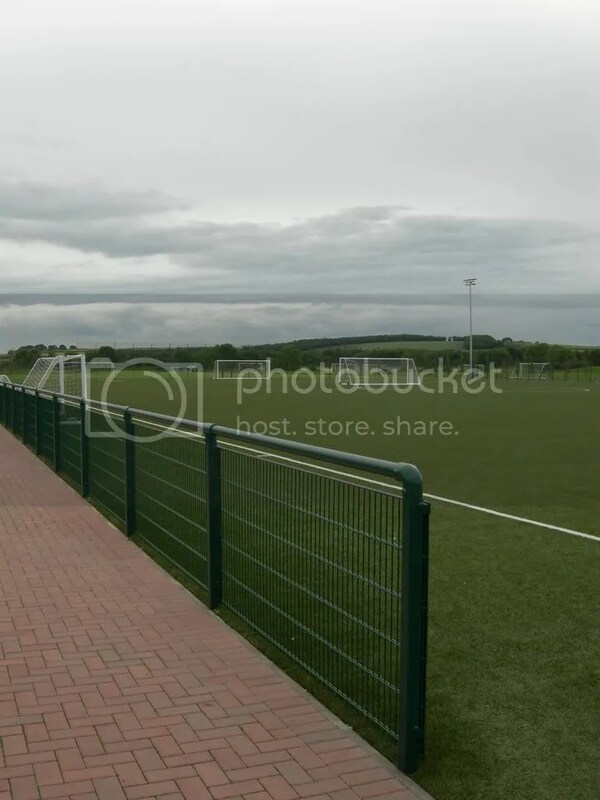 They also extend to a little tour through the players changing rooms and observing the Hibs youth team playing out a five-a-side training game. This tour was entirely due to one man’s hospitality but now things are a little different. As you can see, a peek behind the scenes at the ‘new’ Easter Road was well overdue. With that I mind I was very happy to have my phone booking accepted for myself and my partner’s father, visiting from Canada, by the friendly and helpful club staff that June morning. 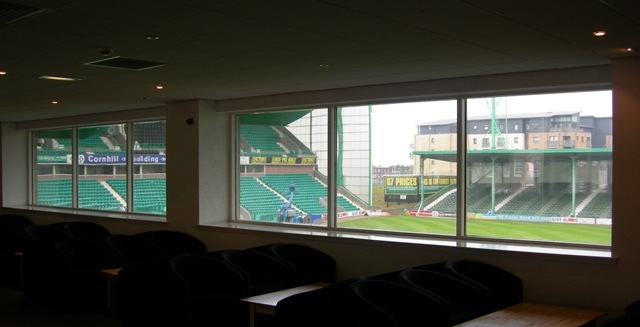 A couple of hours later and we duly arrived to fulfil our booking and were ushered through to the man reception area where a group of people were already gathering for the Easter Road experience. I was glad and happy to re-make the acquaintance of a friendly face in the tour guide Bill Bryson, something of an old Hibee friend by the good grace of the Internet. As we sat down for Billy to offer us his wide knowledge and intriguing stories about the club and its residence, it felt great to be ‘home’. 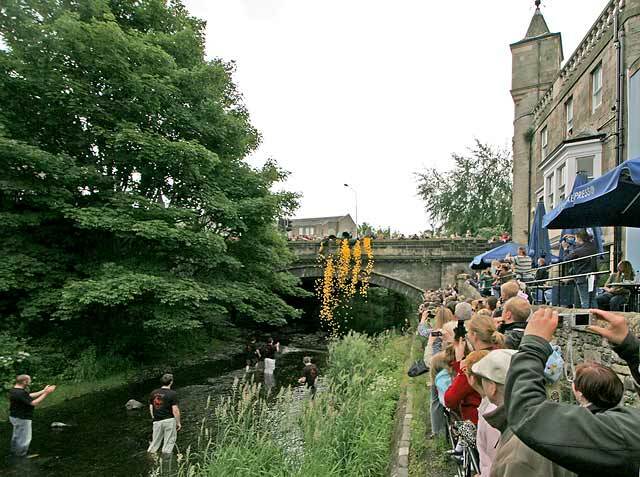 In Edinburgh each year an event called The Stockbridge Duck Race is held in that most pleasant of north Edinburgh areas. 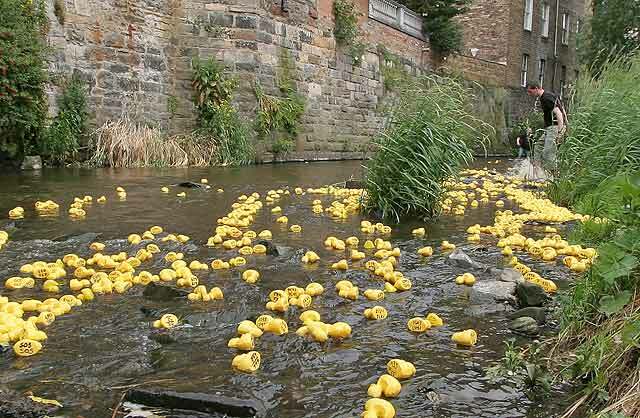 For the 21st time this year, 2000 numbered plastic ducks will be launched from over the bridge at Deanhaugh Street, Stockbridge into The Water of Leith. The ducks float/speed (depending on your fortune) past the Canonmills apartments along The Water of Leith, Edinburgh’s river, where my partner and I and our friends have stayed for my Birthday celebrations the past two years and this is what caught my eye. All photographs are from here. The race has it’s own Facebook group. You can find more details of the fun here. The Water of Leith just outside the car park of where we stayed. Unfortunately there were no duckies out in the bracing November when we stayed. Hearts 0 – Hibs 1! 01 Riordan does it again! Is there any Hibby, with the possible exception of Ian Murray, that takes so much pleasure at putting one over Hibernian’s Edinburgh rivals? What is really remarkable about this famous victor is not that it means Hibs are unbeaten against Hearts this season but that Hibernian had a full ten first team players absent through injury. In effect, Hibs visited Tynecastle with their ‘B’ team and still ran out winners! An interesting story came my way this morning by way of an internet discussion forum. It concerned the case of convicted murderer, Patrick Nicol, a young man who is serving twelve years in Shotts Prison in Lanarkshire, Scotland. Nicol’s conviction came after he was found guilty for the first-degree murder of George Reid, who was stabbed by his assailant Nicol over one hundred times. The Scottish Sun newspaper reports that Nicol is now studying economics at Edinburgh’s Napier University, regularly attending lectures and participating in general student life whilst under the guard of a security firm. His fellow students are reported to have no knowledge of Nicol’s conviction. This brings up many discussion points for me. It is important however to be wary of that particular newspaper’s usual dismal style of sensationalist reporting when viewing the ins and outs of this story. A run at Portobello seems the most apt start to the day once more. I smile when passing the public bathrooms at Joppa noticing that the water in the block is heated by solar power. Good old Edinburgh, in spite of what some may think I still believe it leads the way in quite a few areas of thinking and planning. Back home refreshed, I veer towards a plan to enlarge my ever-increasing supply of available reading matter. This means a visit to West Port near the infamous ‘Pubic Triangle’ to take in a several second-hand book stores. A fresh day ahead and time to take in the old sites and experiences of whenever I coma back home. First of all though I have an appointment – with a certain beach for a morning run. 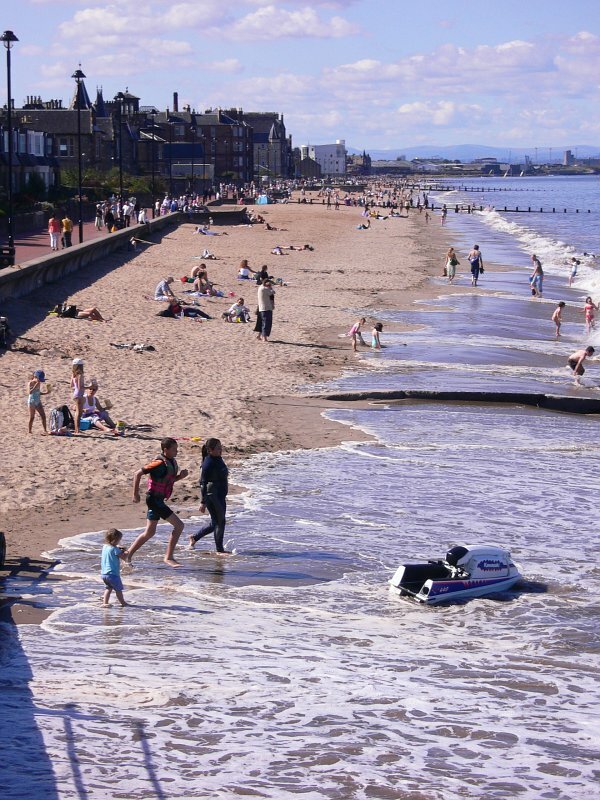 Portobello has always been known as ‘Edinburgh’s Seaside’ situated three miles east of Edinburgh on the south shore of the Firth of Forth. It has an interesting if chequered past and was once an extremely popular resort in Victorian times and on. In earlier days the town had an impressive pier which was eventually demolished due to the effects of storm damage. The town also boasted a feature known as ‘The Marine Gardens’ which was an early theme park of it’s day. Curiously, one of the attractions of the Gardens was a specially imported African tribe who lived there for people’s entertainment and wonder! Portobello is the next door town to place of my family’s origin, Musselburgh – more of which another time. Suffice to say that ‘Porty’ holds many wonderful childhood memories for me and this is just one reason why I still love the place. 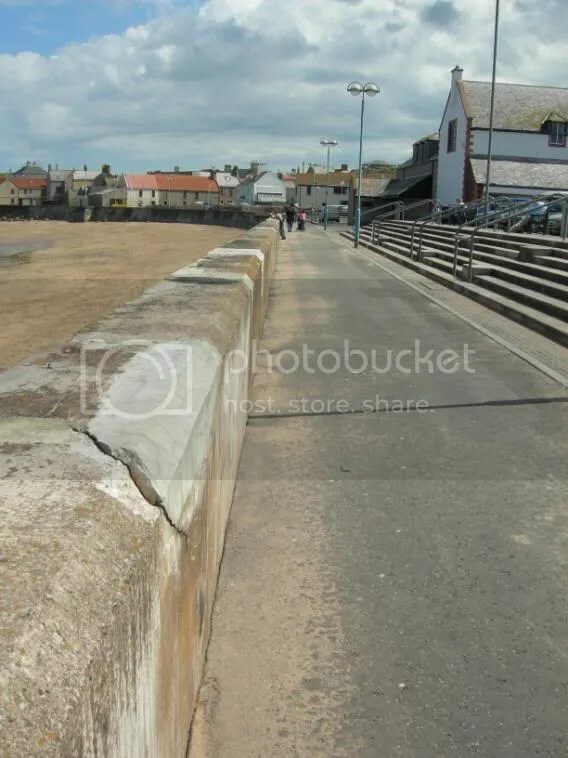 In my childhood days Portobello seemed a place of wonder, with it’s long, sandy beach and popular promenade with attractions for holidaymakers. One of those features was an outdoor pool with a wave machine – arguably the first such item in the world. The water in the pool, though artificially ‘heated’ was probably the iciest in the world! I also have memories of a loud klaxon that would sound when the next wave was due – when us kids would ready ourselves and jockey for position for the ride down the pool. There are less comfortable memories too. One was of one particular late afternoon when a young Stu stayed on the beach playing football just that little bit too long… Fortunately dad was best placed to run down onto the beach from the high walls and scoop me up under his arm as I was cornered by a fast-approaching tide! It was a Tuesday morning early, time to wake up and tackle the drive to Edinburgh this morning. The portents looked healthy as I took an early run in the morning sunlight and home to prepare myself for the journey. Bags packed I stepped into the car and headed off north at 10am towards the A1 and a few hours behind the wheel. Ploughing on through squally showers and dark skies I was soon passing over the Scottish border with only a briskly taken cup of coffee behind me. Heading towards a favourite lunch stop, Eyemouth, a small seaside town. A stroll and a breath of fresh air on the promenade later, I headed towards the renowned fish and chip shop on the main street. It’s the seaside – I’ve driven a long way – I deserve fish and chips I reasoned. The food came over the counter, I paid and received my first sight of a Scottish banknote in a while when I suddenly realised the full weight of what I was about to receive. This place hardly holds back in it’s portions as I manhandled what seemed like a family meal in a large, reinforced cardboard box. It may as well have been a pallet. I finally caught up with Rebus comparatively recently. In my case it was only last year that I began reading the series in spite of the generous reviews and Edinburgh being of my origins. It was the latter that finally convinced me to read the Rebus books and I have to say that seven or eight books later I’m glad I did. Despite the sometime prickliness of the main character he remains difficult not to like, his quick and acerbic wit sees to that. His is a character written by Ian Rankin with great depth and with many levels and skins. The same can be said of many of the main personalities in the books who usually manage to remain unpredictable yet believable. Inspector Rebus is rarely portrayed in a heroic way, but rather as a maverick figure. This may at first appear a little routine in a police story but this facet of his personality is handled carefully by Rankin and never overplayed nor in the least predictable. A landmark birthday then (twenty-nine again) and it was decided at a late stage that this should entail a sojourn up north back to the homeland. Where better to spend a weekend without spending the equivalent of the national debt on enjoying oneself with a little mild hedonism for a couple of days? Four of us ‘to go’ then. beginning at the testing time of Friday at five-ish on the M1 motorway. At least I think it was the M1 as it was completely obscured by a mocking, snaking train of stationary rear view lights as far as the eye could ascertain. Oh the joy, and a quickly disappearing vision of some semblance of a very welcome evening spent in the social coil of Edinburgh. It was a return to my roots last week with a few days of a visit to Edinburgh over a long weekend. 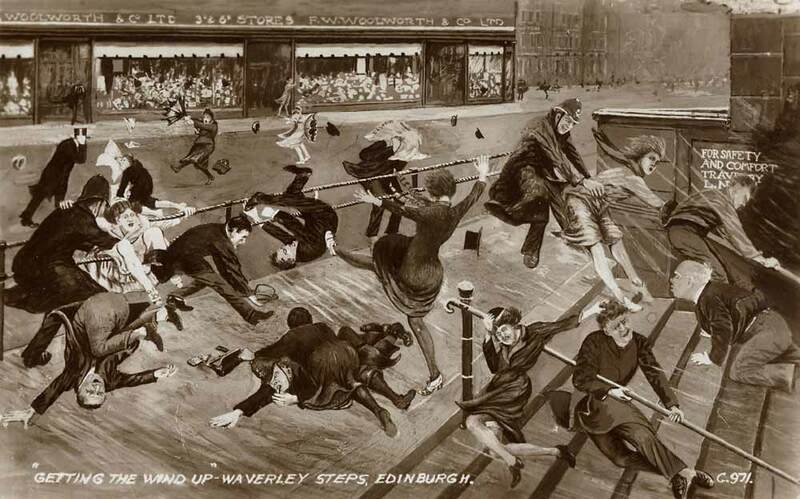 It seems I often tend to visit Auld Reekie at this time of year, I can only suppose that historically this is because it coincides with the early clashes between Hibs and their opponents at Easter Road. 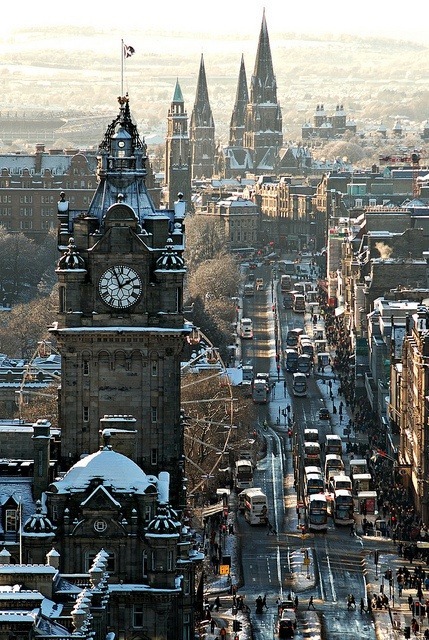 I love Edinburgh in Autumn as I love it in Spring, I love it all the time it has to be said. The early crisping of leaves in Princes Street Gardens reminds me of coming of the harsher winter days so familiar from past times, mid-winter celebrations and good company. The story of Mary King’s Close first came to my awareness during my school ‘daze’ via some dusty library tome. The tale fascinated me then and still does. My interest was rekindled some years ago by Billy Connolly on his ‘World Tour of Scotland’ series when he plunged down into the close with the aid of a guide and camera crew to re-tell the story of the infamous wynde. His story it seems was inaccurate however, more on that later. 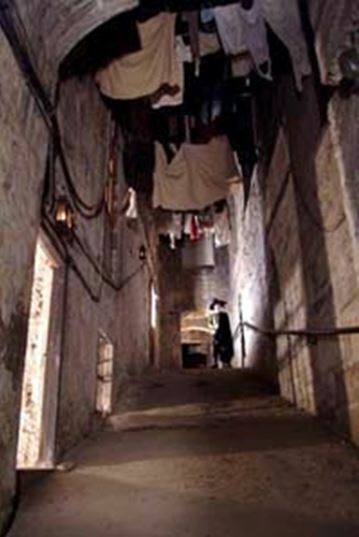 Fairly recently, Mary King’s Close has evolved into a genuine tourist attraction and visit. In the old days, private tours had to be arranged through the council until one or two Edinburgh ghost walks started broaching into a small part of the subterranean street. I had my own historical appetite whetted by the latter and had always wanted to go back now that access was more fully available. 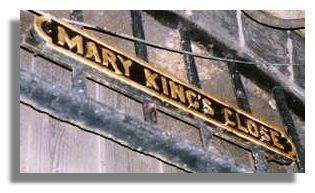 There are countless accounts of the history of Mary King’s Close and rather than offer a detailed historical time-line my preference is to rather give an account of my visit and the personal feelings surrounding that. Suffice to say that the City Chambers situated on the High Street above opposite the austere and imposing St. Giles Cathedral in the heart of the old town now sits above the close. What were formerly tenement buildings of up to seven stories along the close (the world’s first skyscrapers anyone?) were demolished down to three stories in order to make way for the chambers sitting at street level among the granite sets of the Royal Mile. The present day remains are not troubled by daylight where once a little sun filtered into the deep, dank depths of this part of the ancient city. Latterly it seems there was little metaphorical sunshine either. After a short wait, our excellent young guide in the 17th Century garb of a local merchant ushered us through the entrance to the head of the steps leading underground. After a short, spoken introduction we descended into 1635AD, a time of much poverty and deprivation in the area. 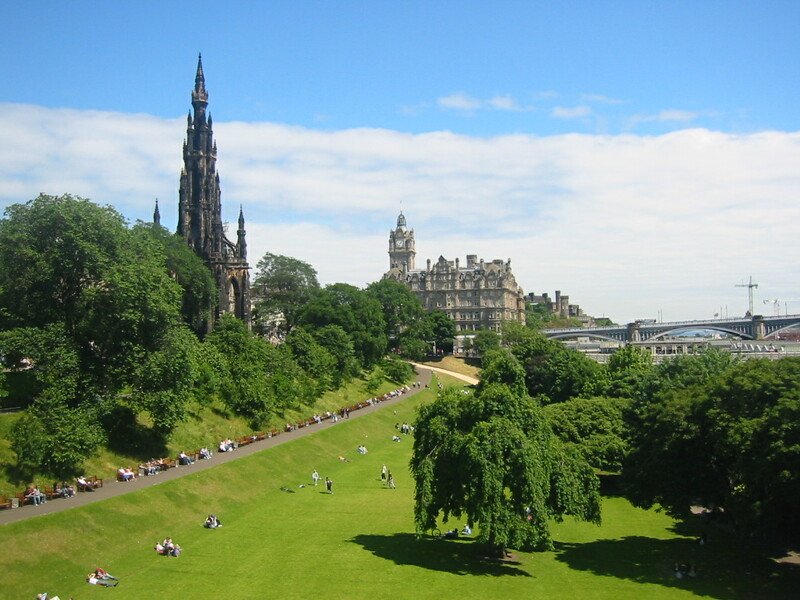 Edinburgh’s old town in those days was a filthy, unsanitary environment with open sewers running down the middle of the street and into the old Nor’ Loch, the infested body of water that was drained to give us the splendour of the present day Princes Street Gardens. In those days the loch was used as a handy place to duck ‘witches’, in fact it was used for dumping practically anything that was unpalatable to your world. Unsurprisingly disease and ill-health were not uncommon in those dire conditions, the worst curse of all being the rapid spread of Bubonic Plague or ‘Black Plague’ as it was known due to its unfortunate sufferers’ skin turning that hue upon the greater progress of its awful grip. Here’s where the stories of Mary King’s close differ. I had always believed that the poor, wretched inhabitants had been barricaded alive in the close by fearful neighbours and local authorities due to the belief that this was the epicentre of the disease. I also believed that the corpses of the dead were left down there for many years as authority workers refused to handle the dead as they were too smitten with fright of the plague. Not so according to our guide. Apparently people stayed there and died there – there was little place superior for them to go elsewhere it seems. This to my ears is a reasonable enough story though of course a tad less romantic (and gory) than the former version. The story of little Annie who died in the close is a touching one which should be saved for the actual visit. Beside the vast pile of toys left for her ‘ghost’ lays a collection which nourishes the Edinburgh Sick Kids Hospital to the tune of thousands of pounds, happily. Alighting into the actual close towards the end of the tour was the most evocative scene for me personally. Interesting enough were the various vaults and workshops, one owned by the local saw-doctor but I felt like I wanted to stay there balanced against a wall of the steep old wynde for a while longer. It was easy to drink in the atmosphere and feed from the hard lives of these former people of Edinburgh, part of the people who I descend from indeed. Peering down the narrow, eerie close was an unforgettable and unique experience, opening a page into Edinburgh’s history. I will go there again one day and pay my respects. If you find yourself in Edinburgh one bright day, go to Mary King’s Close, you will not forget it, nor have experienced anything at all like it.